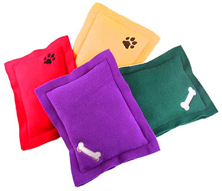 These soft embroidered pillows are made with high-quality polar fleece and come in a variety of styles and colors. Pillows are 8" x 11" x 2" and weigh approximately 3 oz. For a larger view, click on the picture.